Happy Almost Fool’s Easter Day! I have to be at work in a few hours, at 3 AM, so this is all I was able to find in the time I have. How does DragonflyBSD compare to FreeBSD? 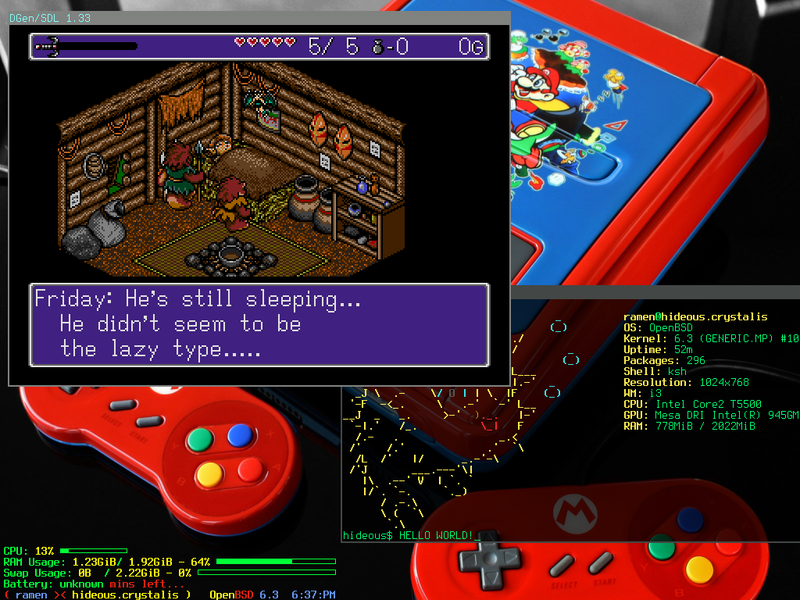 OpenBSD 6.3 Retro Gaming Station with a microsoft sidewinder gamepad pro. Works great! Handling of daemon/gid/uid in application. The February 2018 iXSystems newsletter. Introduction to email (pt. 1): Email basics. FreeBSD Desktop – Part 1 – Simplified Boot. What’s a good BSD to start out with? BSDNow 239 does not have an interview, but it does talk about using OpenBSD to prevent unwanted traffic out to the internet, plus a ‘poetic license’. Molly-guard, a phrase I had never heard before. We all sell out every day, might as well be on the winning team. 90s Police Car Dashboard Computer now runs XScreenSaver. RPG Books as Imagination Training, RPG books as fiction. Yak Shaving. We’ve all been there. This week’s BSDNow includes an interview with Ryan Zezeski of Illumos, plus lots of other topics, including more on NomadBSD and Lumina. Tonight, there’s a QubeOS vs OpenBSD presentation at SemiBUG, plus Michael W. Lucas will be bringing copies of his new SSH Mastery book edition. Late, odd-day post cause it wasn’t up like normal on Thursday: BSDNow 237 has no interview but a number of recent news items, including details on the Pale Moon / OpenBSD port issues that I was not aware of until now. Old games – but not too old, for this week’s theme. Star Control lead devs fire back at Stardock lawsuit. I link to this just to point to the excellent open source game Ur-Quan Masters, which is available on every BSD. Fashion shows are better at the future than movies, according to this jwz post – and I agree. The Basic Toolbox. A good checklist. Freedombox. Not necessarily endorsing this setup, but running your own server is an excellent, excellent idea. Related: The 36th Chamber of Shaolin, one of the best kung fu movies. Shell readability: main and Shell readability: function parameters. The world of Linux Handhelds in 2018. That and the source link comments take you to some tiny hardware, which is my reason for reading. How to tell when a company thinks they dominate part of a market: they drop interoperability with other protocols. It’s a week for good quotes to pull from linked stories. Meltdown-mitigation syspatch/errata now available. For OpenBSD. a2k18 Hackathon Report: Ken Westerback on dhclient and more. Found in comments in previous link’s source: OpenBSD game report on gog.com. I’ve wanted a BSD gaming site for years; I don’t have the time to do that too. Also found, a Reddit OpenBSD gaming group. How do the different BSDs differ with regards to jails? syspatches will be provided for both supported releases. A week of NetBSD #1.